The UK's British Airways is part way through a major £6.5 billion investment programme in its products and services and part of that investment has been in a new help section on its website. 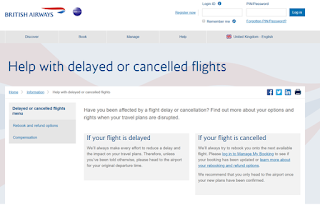 British Airways has added the section on ba.com to help customers change their bookings and find out more about their consumer rights if their BA journey doesn’t quite go to plan. Sure the airline says that most of its 800 flights every day carrying around 125,000 customers pass off without a hitch, delay or disruption. However, the new section will help passengers on the odd occasion when plans don't exactly come together perfectly. 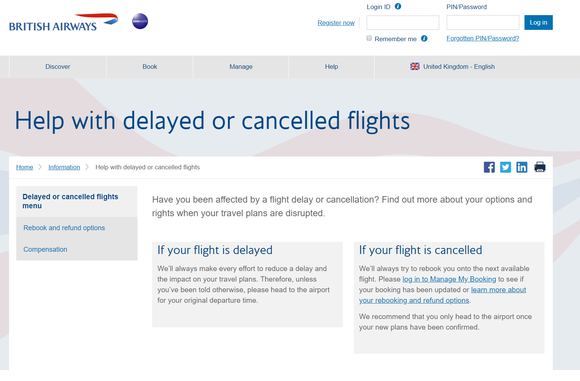 The ba.com/helpme is designed to assist customers with managing their bookings, re-booking, refunding or changing their flights, as well as linking travellers to the specific customer relations teams able to help them request special assistance, claim compensation, locate their bags or apply for reimbursement if they’ve paid extra to reserve special meals or seating. This new approach speeds up the resolution time by immediately connecting customers with the relevant department, rather than the general customer relations team, it also allows passengers to manage most, if not all, functions online, rather than taking the time of a staff member on the phone or face to face at the airport. The investment and the change in which it operates at the airport, British Airways is reducing staff numbers by training its customer service agents in all aspects of a customers journey. The staff will be trained to help with ticketing, re-booking, changing reservations, finding delayed luggage, providing up to date flight information and more. It is designed to ensure that the first agent a customer meets will be the person that resolves their issue. By having multi-skilled staff at the airport BA hope to reduce the overall number of staff needed both at the airport and those working in back office roles.